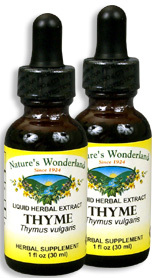 Thyme Extract, 1 fl oz / 30 ml each (Nature's Wonderland) - Penn Herb Co. Ltd.
Thyme is the familiar culinary herb that also serves as a popular botanical support for the throat and upper respiratory system. The aromatic herb promotes healthy digestion and supports immune function as well. Famed English herbalist, Nicholas Culpeper, described Thyme as a 'strengthener of the lungs...and taken internally, comforts the stomach and expels wind'. Throughout the years, Thyme has indeed proved to be an effective herbal support for respiratory and digestive functions. European herbal medicine texts recognize Thyme for soothing the bronchial and upper respiratory system. COMMON NAMES: Avishan (Persian), Bai li xiang (Mandarin), Common Thyme, Garden Thyme, Timus (Albanian), Tomillo. AMOUNT PER SERVING (500mg/ml or 30 drops): Certified Organic Thyme Leaf (Thymus vulgaris). OTHER INGREDIENTS: Grain Alcohol 40-50% by volume), Deionized Water. Free of: milk, dairy, egg, fish, shellfish, tree nuts, peanuts, wheat, gluten or soy. Soothes bronchial passages; supports throat health; supports respiratory function; helps maintain clear breathing; promotes healthy digestion; supports immune system; eases digestive cramps, menstrual cramps; helps ease tension and stress.